For their 125th anniversary Bulgari decided to throw their first retrospective from the opening of the first shop, (on Via Sistina, Rome), to our own day. 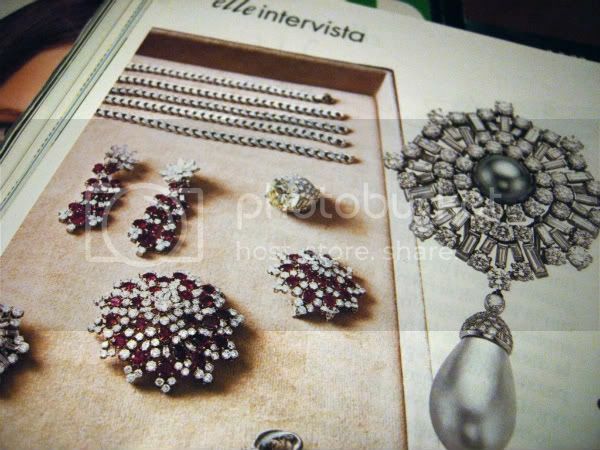 The exhibition "Tra eternità e storia: 1884-2009" ("Between History and Eternity: .. ") is held in the imensious gallery of Palazzo degli Esposizioni (Via Nazionale) and rechapters five hundred masterpieces of necklaces, watches, bracelets and other precious accessories, from the maison's archives, “The Vintage Collection”, and from private collections - never shown in public before. The exhibition is articulated in eight sections, organized chronologically. It begins with a collection of works in silver from the late 19th century crafted by Sotirio Bulgari, the ingenious and enterprising Greek silversmith who moved to Rome in search of fortune, and who in 1884 laid the foundations for what would become one of the world’s premiere jewelers. Their first shop was named "Old Curiosity Shop", inspired by a Charles Dickens novel. On the left- Sotirio Bulgari (left) infront of his shop. On the right- Bulgari store today on Via dei Condotti. Then there's a whole room dedicated to Elizabeth Taylor's personal boudoir. 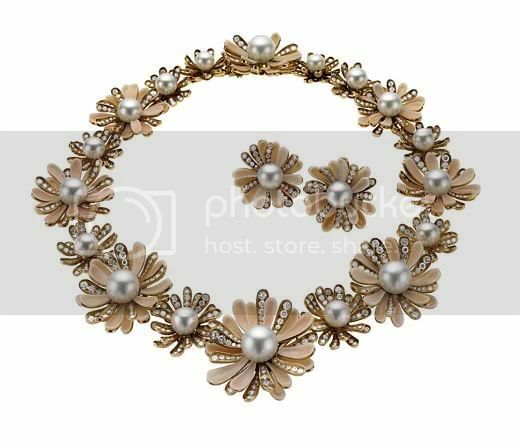 The collection of sixteen one-of-a-kind-pieces include also the famous ones that Richard Burton gave to her for the wedding (before&during&after). While Richard was still married (to Sybil Williams), their romance seemed to take place as much inside the Bulgari store as on the nearby sets of Cinecittà. Elizabeth Taylor and Richard Burton on their wedding day (Montreal, 15th of March, 1964). Liz wearing only an emerald brooch, an engagement gift from Richard. 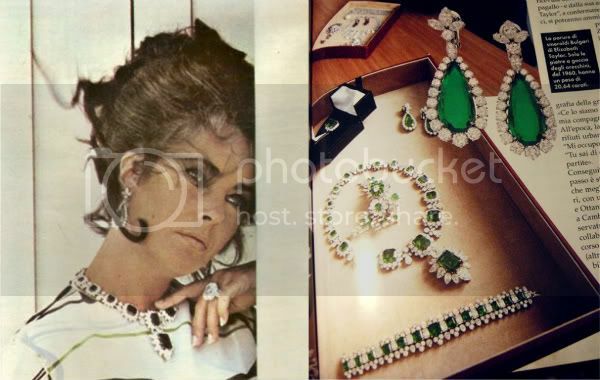 Liz wearing a "Tremblant" brooch in platinum, with emeralds and diamonds, photo taken in 1969. Elizabeth's "candies", only the earrings, from 1960's, are 20,64 carats. But the relationship between Bulgari and the movie industries has blossomed since the late 20's. So, by naming Mary Pickford, Audrey Hebpurn, Grace Kelly, Ingrid Bergman, I'm mentioning only few divas of the hollywood golden era, who were mad about the italian haute joaillerie maison. 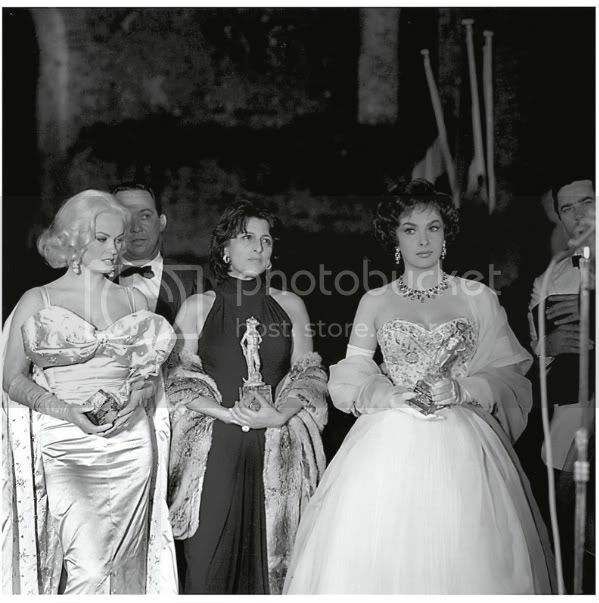 From the left- Mamie vad Doren, Anna Magnani and Gina Lollobrigida at the Italian Academy Movie Awards in 1958, holding the famous David di Donatello, made by Bulgari. 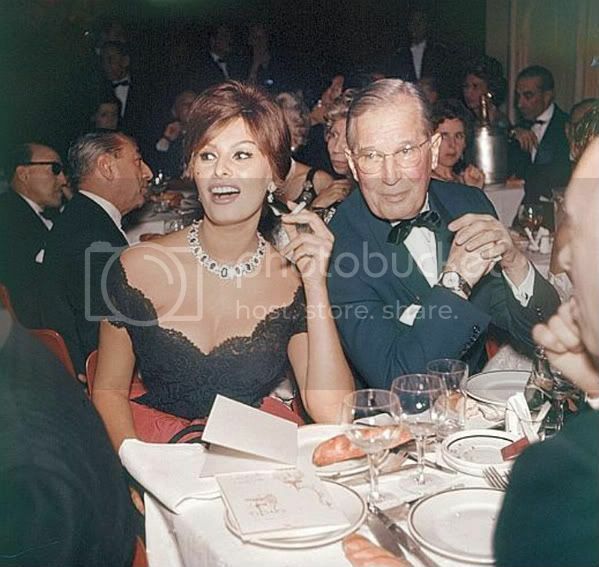 Sophia Loren and Maurice Chevalier at Gala, Paris, in 1960. On the left- Claudia Cardinale on the Bulgari Event (Paris), choosing Bulgari jewels which she'll wore in the La Panthere Rose. On the right- La Panthere Rose poster, 1964. On the left- Ingrid Bergman on the set of "The Visit", wearing Bulgari jewels, 1964. 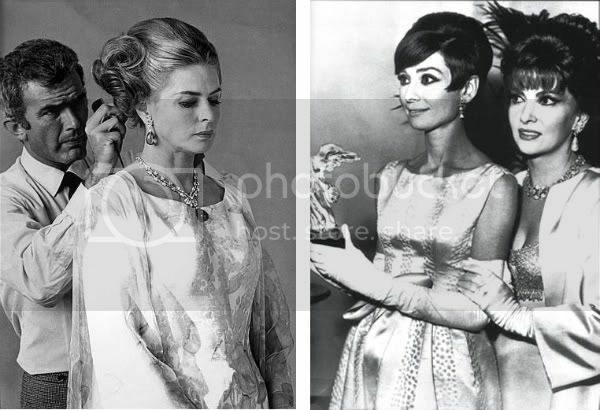 On the right-Audrey Hepburn holding the Victoria award and Gina Lollobrigida wearing diamonds and pearls, 1965. There's the section dedicated for the "Dolce Vita Romana" period, where exposed jewels worn on screen and off by the most famous italian actresses of the '60s like Sofia Loren, Gina Lollobrigida and Anna Magnani. In these years Bulgari distinguished from the French school and found it's own identycal style (for what known today) - the decisive, stylized forms, soft volumes and unprecedented chromatic combinations. A gorgeous 18-karat gold necklace from the Sixties with flowerlike clusters of emeralds, rubies, sapphires and diamonds. 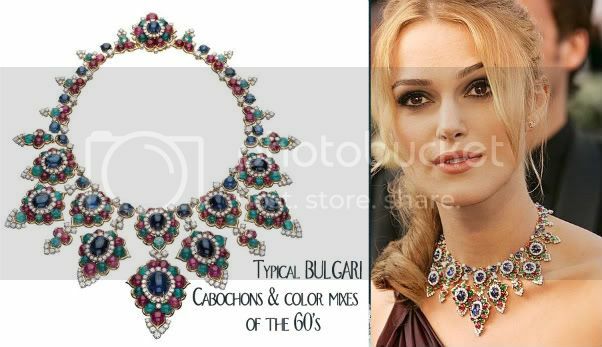 Keira Knightley borrowed the piece for the 2006 Oscars; before that, it was owned by Princess Soraya of Iran. 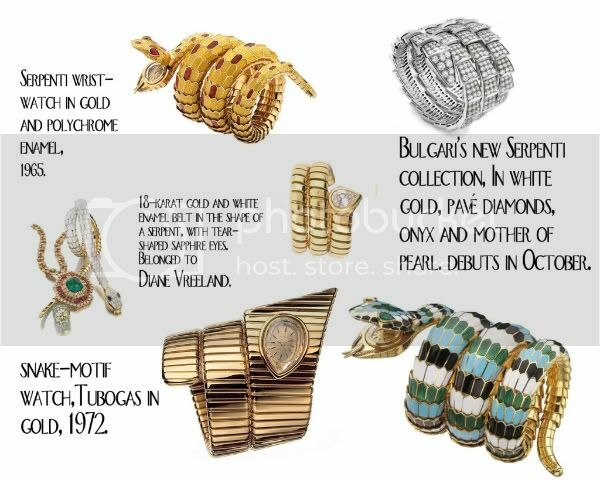 “Bulgari comes into its own in the Sixties, the dolce vita period when you can see the cabochons and color mixes. The great innovation is really the mixing together of all different colors of gems,” - Amanda Triossi, curator of the retrospective. Anna Magnani wearing platinum and diamond bracelets that Bulgari created especially for her. 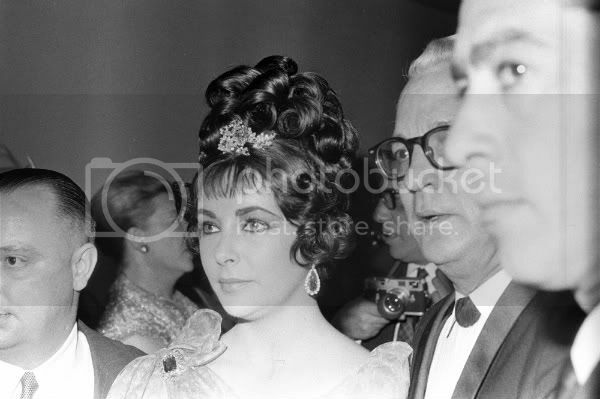 On the left- Gina Lollobrigida with a blue Bulgari diamond, 60 carats. 1965. 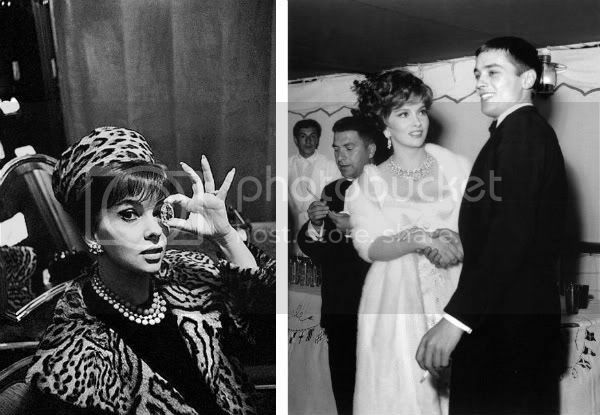 On the right- Gina and Alain Delon during the Cannes Film Festival in 1961. She wears the same necklace in "Woman of Straw", year 1964 (co-actor : Sean Connery). During the 1940s, Bulgari introduced their first timepiece, the snake-watch, that was inspired by the Art Deco period of the '20s. It quickly became an unmistakable attribute of jewel-watches and has been masterfully reinterpreted over the years. The historical classic was worn by Liz when she interpreted Cleopatra. It is then, that Bulgari becomes more accessible and wearable for everyone, as they launch their first Pret-a-Porter Collection and open more stores in Paris, Ginevra, Monte Carlo and, in 1972, also in New York. The new creations are strongly influenced by pop art and flower-power (hippies) moment of the time. 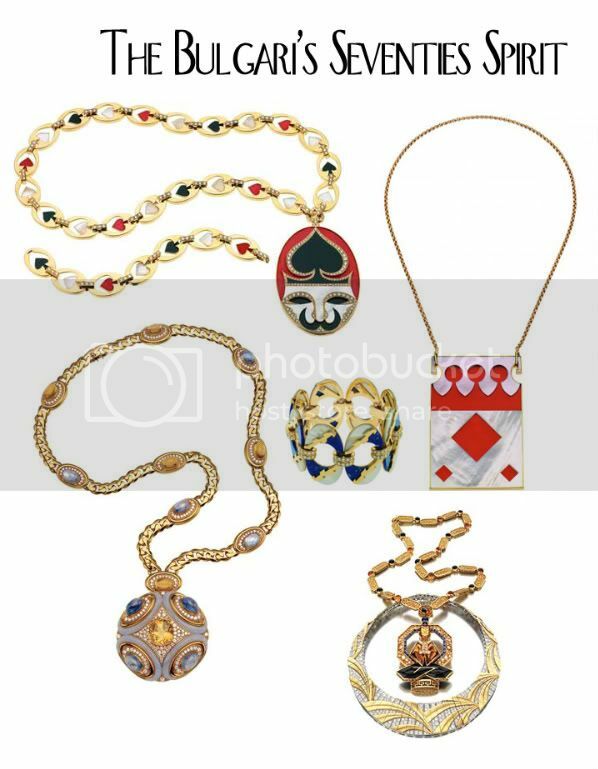 Infact some of the most bizarre designs are created in this decade, like a diamond clutch in the form of a melon, necklaces with pendants in the form of playing cards and chess pieces in the form of champagne bottle caps. The exhibition is until 13th of September. The curator of the retrospective is Amanda Triossi. Read more about the exhibition on the gallery official homepage (click). I'm trying to organize and go to see the exhibition next week, so stay tooned for some of my pics and comments! On the plateau Anna Magnani's Bulgari jewels, collection now owned by Carlo Ferrero Zendrini.